Eccentric clothing, the buzzing excitement of dance proposals, and the seniors’ booming blowhorns can only mean one thing: homecoming. This year’s homecoming week, themed Pixar movies, was chock full of school spirit from students and faculty alike. Explore this package for a complete immersion in Homecoming Week, updated through the week. 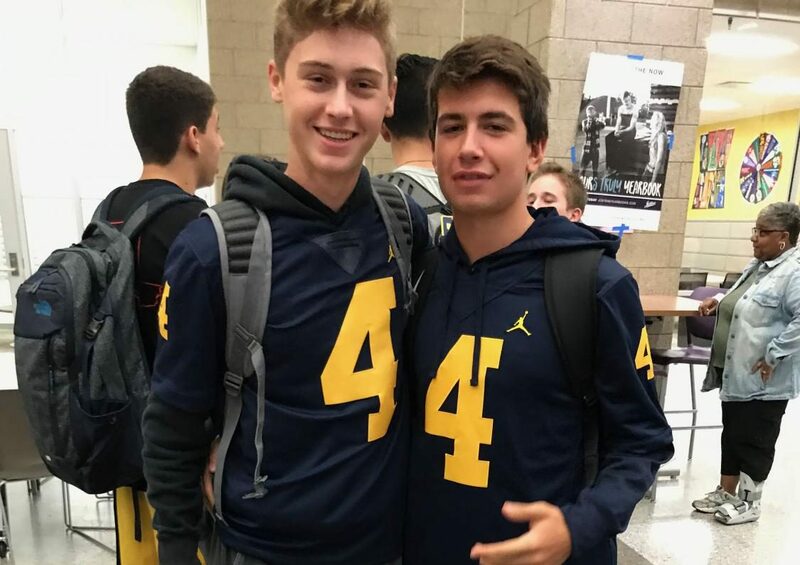 Juniors Dominick Cowdrey and Justin Satawa show off their matching University of Michigan football jerseys on Monsters University Day. The first day to kick off homecoming week was Monsters University Day (college apparel day). Students showed off their favorite college apparel as they celebrated the first out of five spirit days leading up to the homecoming dance. According to a Hawkeye poll, the most represented school was the University of Michigan. 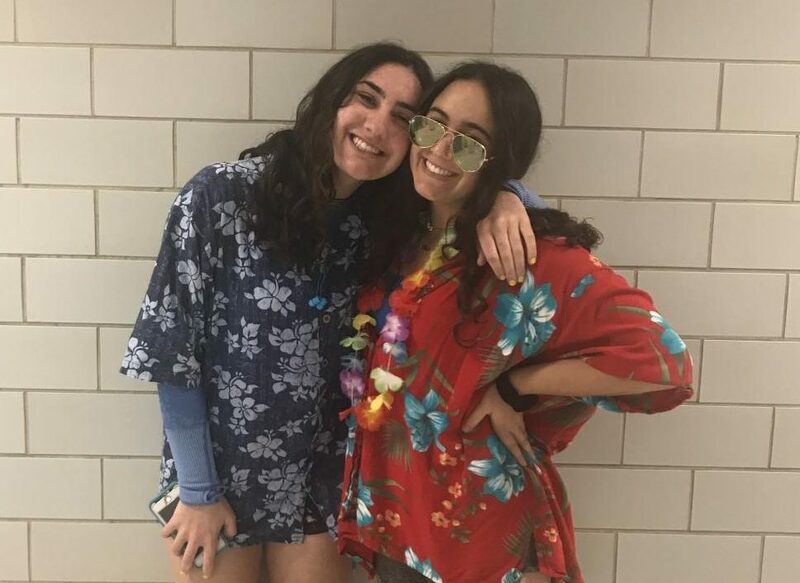 Juniors Lexie Finkelstein and Kaela Bernard sport Hawaiian-print shirts for a tropical theme. Under the Sea Day marked the second day of the Homecoming Spirit Week. On Under the Sea Day, students all over the school wore spirit wear related to water, beachwear, and tropical wear. Students were also able to pick up a homecoming package today. Homecoming packages include spirit wear for each grade related to their theme including a noisemaker, a t-shirt, and headwear. 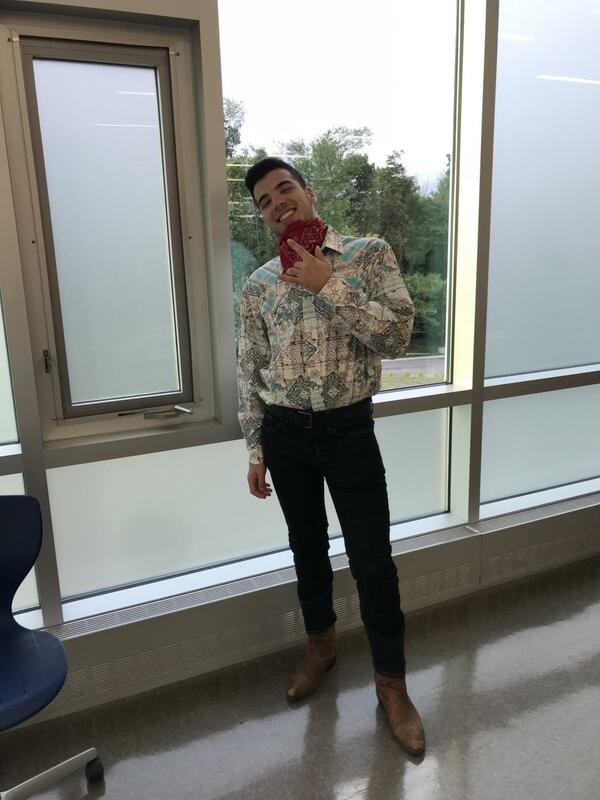 Senior Asher Moskowitz goes all out with his cowboy outfit. Wednesday was Wild West Wednesday, themed after the Pixar franchise Toy Story. From cowgirls to cowboys to cows, the students at BHHS dressed in their flannels and bandanas and came into school ready for the most rootinest tootinest day in the wild wild west! The final scores of Western day were 12th grade: 4, 11th grade: 5, 10th grade: 3, 9th grade: 2, staff: 1. Today was also the last day for students to pick up spirit packages in preparation for the Black Hawk games on Thursday. Seniors participate in tug of war, one of the events of the Games. On Thursday, students wore their class shirts reflecting the theme of spirit week. The freshmen (Finding Nemo) dressed in orange, sophomores (Monsters Inc.) dressed in black, juniors (Toy Story) dressed in blue, and Seniors (The Incredibles) dressed in red. 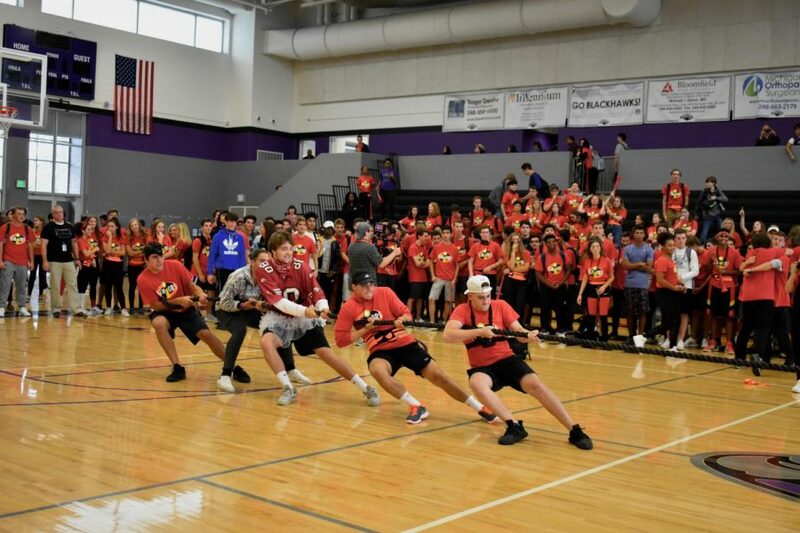 Students were dismissed from their 7th hour to attend the Black Hawk Games in the gym, where each grade competed in a series of events to earn homecoming points for their grade. “Although I loved dressing up in all of the black, green and blue that I could find, the best part was cheering on my grade during the Annual Black Hawk Games,” said Sophomore Allie Yaker. At the games, students from each grade competed in a variety of games which tested their athleticism, flexibility, and even rock, paper, scissors abilities. Hammer Authority performs their signature cheer. 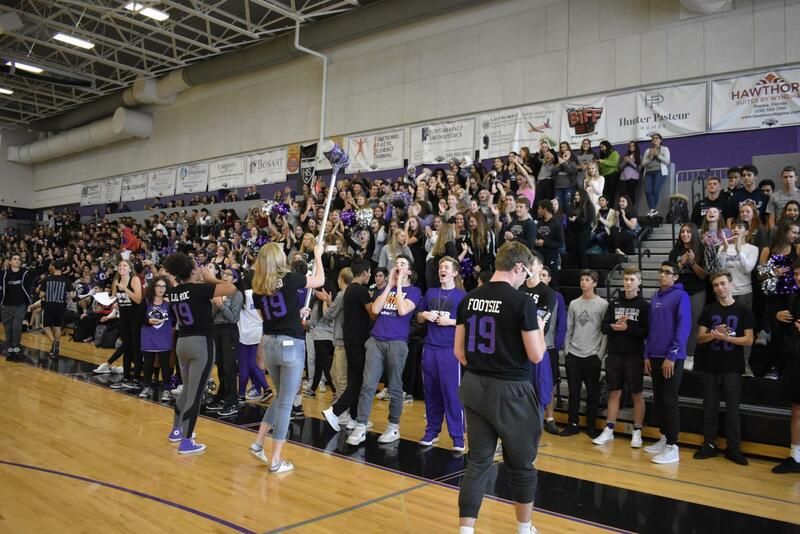 Homecoming week ended with a sea of purple and black flooding the hallways and stands of the homecoming pep assembly, as the last day of homecoming spirit week was Black Hawk spirit day. Students geared up for the upcoming homecoming football game and dance by showing their Black Hawk spirit. The excitement carried all through the school day, from the students being welcomed to school in the morning by decorated hallways, to an energetic pep assembly put together by Student Council. This year’s pep assembly featured a performance by the staff band, as well as the annual performances by the marching band, cheer team, and poms team. The Blackhawks compete against the Clarkston Wolves. 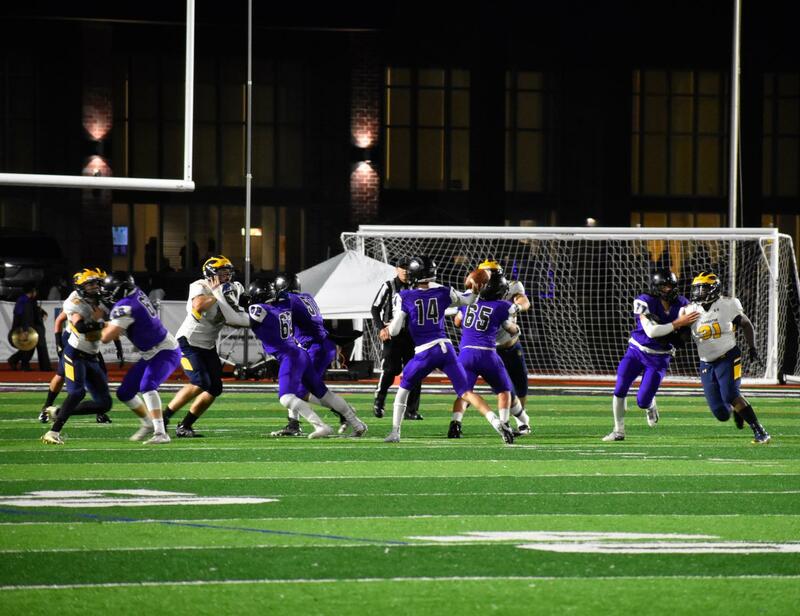 On Friday night, the football team will face off in the annual homecoming game against the undefeated Clarkston Wolves, who are coming off of a 2017 state championship. The Black Hawks look to snap a three-game losing streak with multiple injuries. Starting quarterback Andrew Barash is among those injured, and he will be filled in by sophomore Tanner Slazinski. The game kicks off at 7 pm at Bloomfield Hills High School; the student section theme is blackout.